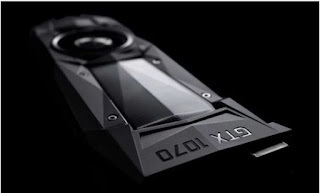 NVIDIA lunge in the world of graphics card manufacturing industry is very interesting and worth the wait. From the latest news circulating, it has been mentioned that NVIDIA is currently preparing the graphics card GeForce GTX 1070 Ti to be launched later this month. In addition to support for 2,423 stream processors on 19 of the 20 SM enabled units, the GeForce GTX 1070 Ti graphics card also has 152 TMU (Texture Mapping Units), 64 ROP (Raster Operations Pipeline) and 8Gbps 8GB GDDR5 memory, generating 256GB / s memory bandwidth. And in comparison, the GeForce GTX 1080 has 2,560 stream processors, 160 TMUs, and the same number of ROPs, while the GeForce GTX 1070 has 1,920 stream processors, 120 TMUs, as well as the same number of ROPs. Then how about the clockspeed diusungnya? According to the leak, the upcoming GeForce GTX 1070 Ti graphics card will reportedly carry the core clock of 1.607MHz (same as GeForce GTX 1080 and higher than 1.506MHz core clock on GeForce GTX 1070) and boost clock 1.683MHz (same as in GeForce GTX 1070, and lower than the 1.733MHz boost clock on GeForce GTX 1080). As for its own power intake, the next GeForce GTX 1070 Ti will reportedly rely on TDP 180W, with power supplied from a single 8-pin PCIe connector. This power intake is the same as what is owned by GeForce GTX 1080, and slightly higher than the 150W TPD from GeForce GTX 1070. Rumors of this latest NVIDIA graphics card will be launched on October 26th. By the time of its release, there is some speculation that if NVIDIA will present the graphics card GeForce GTX 1070 Ti coincides on Halloween (which falls on 31 October). Unlike the price offered on the GeForce GTX 1080 ($ 499) and GeForce GTX 1070 ($ 379), NVIDIA is reportedly going to cost the latest GeForce GTX 1070 Ti graphics card for the upcoming approximately $ 429.